Considering a new tent? It’s a big decision, and the selection and price range can be confusing. However, just asking yourself a few simple questions can put you on track to make the perfect choice. Our camping experts draw on decades of experience to offer the right questions … and answers … to make sure you find exactly the tent you need for years of fun with your family and friends. Must have tent accessories: Tent Kit & Seam Sealer for easy to clean, setup & repair. Light & Lantern. Rainfly & footprint for waterproofing. Air Matress & Sleeping Bag for comfortable sleeping. Dome Tent Types: Dome tents are good for backpackers or small group. Easy to set up. Keeping warm. Cabin Tent Types: Cabin tents are spacious easy to stand in. Very stable. More doors and windows. Good ventilation. Truck & SUV tents provide a comfortable sleeping area. Truck and SUV Tent Types: You can opt to stay high and dry with tents that mount on SUV or truck beds. Some are designed to let you incorporate the back of your CUV, SUV, or Minivan into the tent's layout, turning your vehicle into a comfortable home away from home, like the Sportz Midsize SUV Tent. The Napier SportzTruck Tent 57 Series allows you to sleep comfortably protected in the bed of your pickup, it sleeps two and has 5' 7'' of headroom. 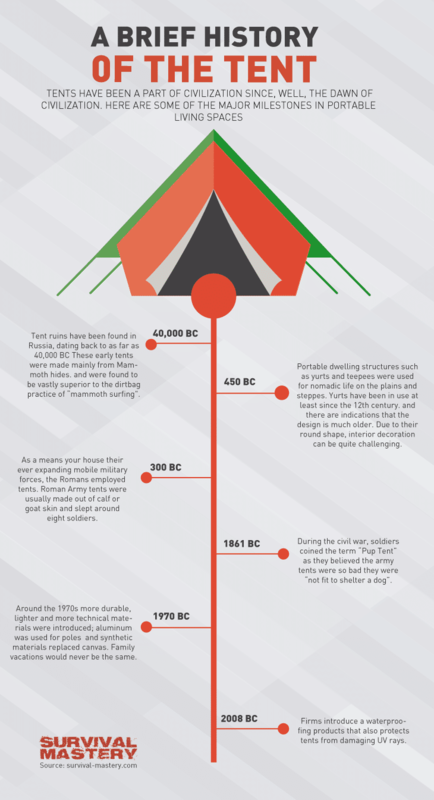 History of the Tent: Tents have been since the dawn of civilization. Here are some interesting milestones in portable living spaces in the last 40,000 years! Tip: Start scoping out what camping gear you already have vs. what you still need and shop the camping area of Basspro.com for what you need. Tip: Print out a helpful camping checklist here, then check it off the checklist while you load up. Click here to see a larger view of How to Findthe Right Tent for You.